Russian Video: A Serious Accident in Nikulin Circus in Moscow! 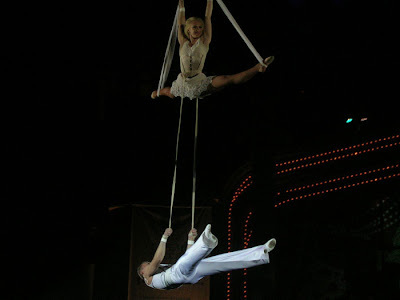 Wednesday night acrobats of the Nikulin Circus in Moscow Yulia and Alexander Volkov fell during a rehearsal from 6 meters (almost 20 feet) height. Yelena Volkova received a severe brain injury and presumably broke her vertebrae, underwent leg. Alexander Volkov got heel bone fracture and other damages. They were taken to the hospital and necessary surgeries were done. Now they condition is still considered serious. They both are very experienced circus actors (They got “Silver Elephant” on the 7th Moscow International Circus Festival of Young Artists). The circus act the artists were rehearsing is considered very difficult and dangerous. It includes 330 seconds of performing in the air and wrapping their limbs in long swaths of cloth without using safety wires, similar to performances on a flying trapeze. This entry was posted in Documentary, Theater on December 10, 2009 by admin.